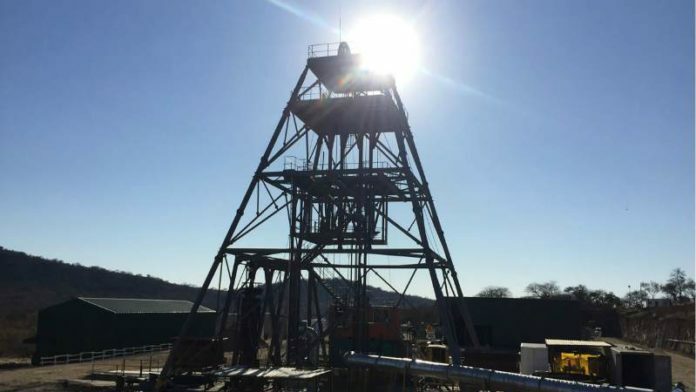 CALDEONIA Mining Corporation, a company that operates Zimbabwe’s Blanket mine, has hedged 100% of its gold production from February to June – some 22,500 ounces – whilst it completes the final sinking of its Central Shaft project. “This part of the Central Shaft project is relatively capital intensive,” said Steve Curtis, CEO of Caledonia Mining in a company production update for 2018. “In light of our significant capital expenditure commitments, we believe it is prudent to take advantage of the recent strengthening of the gold price,” he added. Caledonia Mining has therefore agreed to sell its gold over the five months for a minimum price of $1,250/oz whilst writing in options for possible gold price improvements. “Caledonia will continue to monitor the gold price in conjunction with our projected cash position and review our hedging strategy as appropriate,” said Curtis. First production from Central Shaft, which was due in 2021, would take production from Blanket to about 80,000 oz/year. Curtis said capital investment would decline in the second half of the year and then reduce further in 2020 as the project neared completion. The shaft was at a depth of 1,150 meters and will be sunk to a depth of 1,204m. Caledonia Mining announced fourth quarter production of 14,952 oz, a seven per cent increase over the previous quarter and taking full year production to 54,512 oz. This was roughly in line with guidance of 54,000 to 56,000 oz. Commenting on its prospects for 2019, the company said it expected to produce about the same amount of gold annually until Central Shaft kicked in. The life of mine was currently at 14 years (from six years in 2014). Exploration continues at Blanket with the objective of further extending Blanket’s life of mine, it said. Caledonia Mining is due to report its full-year results numbers on or around March 20 where the impact of the difficult operating environment in Zimbabwe is likely to make its presence felt. It said on November 14 that a shortage of foreign exchange could impede its ability to complete the Central Shaft project. “Difficulties in obtaining sufficient foreign exchange may jeopardise Caledonia’s ability to implement the Central Shaft project as planned,” the company said in its third quarter results in which adjusted share earnings fell 17% year-on-year. The lower earning number was blamed on a weaker gold price and higher production costs. Net cash from operating activities was “robust” at $6.8m, the company said, although it acknowledged cash was lower than the comparable quarter which was an unusually strong quarter. Net cash at the end of the quarter was $5.9m. The operating environment in Zimbabwe is not getting any easier. Bloomberg News reported that the Zimbabwean government had hiked the prices of gasoline to $3.11 per litre from $1.34 and diesel to $3.21 per litre from $1.49, effective Saturday midnight.